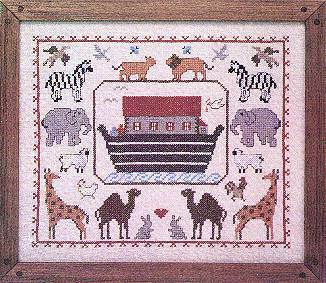 Home > Folk Art > Noah's Ark Sampler 12" x 14"
Noah's Ark Sampler 12" x 14"
This cross stitch stamped sampler represents a Noah's Ark.Building a Noah's Ark is very difficult, but stitching this printed cross stitch sampler makes it very easy to have an Ark , filled with animals to compliment the scene. A craft stamped sampler kit will satisfy an adult's desire to be a child at heart, when completed. I am still in the process of working on it and very much enjoying it. A nice assortment of colors and a very appealing design. I am also planning to use this as a birth sampler. This was the perfect birth sampler for a new family member. There were available spaces where the name and date could be added. Excellent directions with good quality linen and floss made the project a joy to work on.